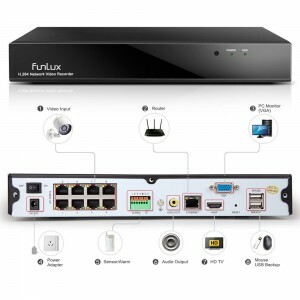 Funlux PoE 8 Channel IP Kit Review- what's all the fuss about? Funlux PoE IP Kit Review- what’s all the fuss about? 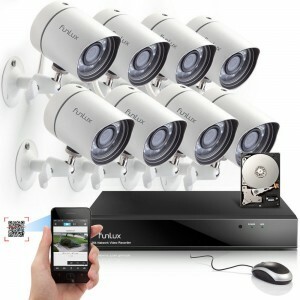 This all in one 8 channel 720p CCTV PoE kit by Funlux (Zmodo) has everything you need to create you’re your own security system for your home or business. You get a 500Gb hard drive with this bundle, plus the cameras can record at night, and has the famous IR filter which many systems boast, which gives truer life like colorful images. With remote monitoring via your smartphone courtesy of the free Zsight app, this system has a lot going for it, for anyone who wants an install once, set-and-forget system. The 720p cameras are also weatherproof so you can keep a watchful eye outside and inside of your property. Connect the camera to your wi-fi connection and remote monitor your system from wherever you are by logging into meshare.com. Once this poe system is set up it will send you push alerts to your email if you have enabled motion detection. Then you can have a quick scan on your smartphone or web browser and view the real –time footage and rewind back if needed. Recording with motion detection ensures less hard drive space is used up. Once the system detects motion it will record at 30fps. The system can also record up to 200fps. If you set the system to record in continuous mode, the included hard drive will last up to 25 days. But at full HD 200fps you will get about 6 days of recording time. You can set it to self wipe and it will start all over again. You can also opt for a system that has no included hard drive and supply your own hard drive of up to 2TB. 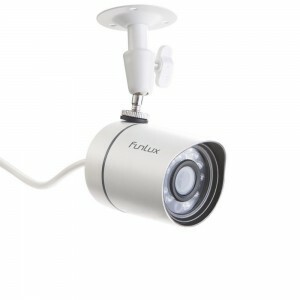 You can get the 4 channel 720p Funlux system for much cheaper. If you aren’t going to need 8 cameras this system will cost significantly less. If your home or property doesn’t warrant having 8 cameras, the 4 camera system has the same specs and it might be wiser investing your money there. The 2.88 mm angle lens provides a larger viewable image than SD or 960H (460k pixels) cameras. With 1280x720p HD images (1 million pixels) the resolution and clarity of the images is vastly improved over analogue systems – double that of a 960H system. This system is real easy to install and set up. There is a HDMI port on the back on the NVR which means you can hook up to a HD monitor and watch the images as they are recorded in hi-def. Funlux are a respected leader in the CCTV security industry and the Pittsburgh police use this exact system to watch tough neighborhoods. 8 channel NVR (network video recorder) with QR code for scanning device to display of Zsight app. Each camera in this system has it’s own web server. If you want to dig into the the configuration settings in further detail and make more adjustments to each cameras individual color, resolution and feed settings, you can do this via the cameras IP address. Here you can also set up individual alert alarms for each camera. This cannot be done using the NVR. You can also set up each camera to send images to up to 3 email addresses. Be warned these settings are only for advanced users and as such there are no support manuals to bail you out if you get into trouble. If you set the funlux 8 channel system to motion detection mode make sure you play around with the sensitivity setting and test it out first. You may find that the system records when trees or bushes blow in the wind or else not at all if you set the levels too low. You can block out certain areas of the cameras viewpoint using the graph settings on the NVR. This will stop your systems alerting you as much and recording natural objects moving. Experiment with the settings before you are confident with leaving the system to run in motion detection mode. The detail of the images over day time recording is very good, at night like all low-medium end systems the picture can get grainy unless you have outside lights to help. If you log into meshare with your Zsight app credentials you can view your cameras footage on a PC or MAC. If you don’t you can only use the IE browser. Viewing on a MAC is out of the question unless you are running IE via windows. If you want to check your footage after an incident or have a scan through just before wiping your hard drive you can view there are markers displayed on the timeline that let you easily find the footage where the system detected areas of movement. You can then select these areas and watch them for closer analysis. You might find someone casing the joint before they return for a break in. The phrase easy to install is touted quite a bit around security systems. But apart from drilling up your cameras, you only have one Ethernet cable to run from each camera to the NVR. No multi stand coaxial cables need to be taped up protected or forced through tiny gaps to get the feed to the NVR. You also don’t need to set up port forwarding to configure remote monitoring. Scan the QR code underneath the NVR on your smartphone and the Zsight app is good to go. Albeit if you want to view the system on a PC and not on a smartphone app if you are not using meshare.com you will have to set up port forwarding to view each camera individually and control the NVR. This system is still in it’s infancy so we hope to see improvements in browser support and better printed manuals, and support for MAC’s for those who don’t want to use meshare. But the cameras work fine and display great quality images, the NVR is easy to use and with the QR quick scan code, Zsight app and meshare.com, this system has a lot going for it.